When I was at the Asian grocer the other day, I picked up a whole duck, with its head still attached, for a reasonable price. I always intended to prepare it for Sunday dinner, but it wasn’t until today that I decided how to prepare it. I had always wanted to learn how to debone a duck, so I set out to do a search on YouTube. Out of the various videos I watched, only the one by Pepin looked fairly easy. Of course, he was doing it with a chicken, but he said the technique could be applied to any bird. Because of my inexperience and the fact that ducks have more connective tissue than a chicken, I had to use my knife a bit more than Pepin, but in about 30 minutes, I had a nicely deboned duck. While I was working on the duck, I was cooking my brown & wild rice. Once it was done, I mixed it with sauteed, chopped onion, rubbed sage, pecan bits, and salt & pepper. I first stuffed the leg cavities of the duck, then spread a layer of the rice mixture evenly on the spread-out, inside of the duck. Using Pepin’s technique with twine, I rolled up the duck and made my galantine. I roasted the duck for 1.5 hours at 375°. 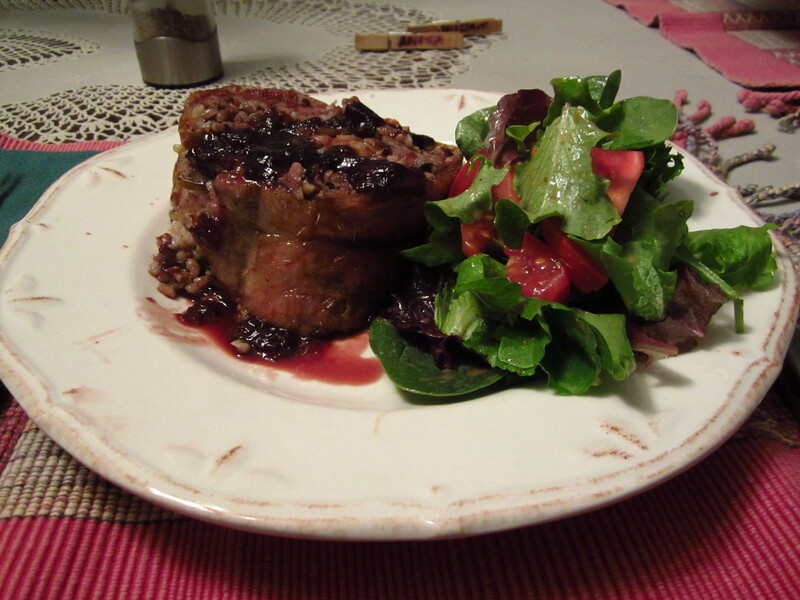 While it was resting, I prepared the balsamic plum sauce. I highly recommend that you watch Pepin’s video on how to debone a duck before attempting this recipe. The duck tasted fabulous, especially with the plum sauce! Debone duck and lay out flat. Sprinkle the inside with salt and pepper. To prepare the stuffing: Sauté onion in olive oil until onion is transparent. In a large bowl Add salt, pepper,rice, sage and pecans. Stuff the duck’s legs with the prepared rice stuffing, then spread an even layer on the inside of the duck. Roll duck and wrap with cooking twine to make the galantine. Place the stuffed duck on a rack in a roasting pan breast side up and sprinkle all over top and bottom with salt, garlic powder, and pepper. Roast at 375ºF for about 1 1/2 hours, basting every 30 minutes. When duck is done let it set for about 20 minutes to let the juices settle before carving. While the duck is resting prepare the plum sauce: In a medium size saucepan, combine the can of plums (you can cut the plums in quarters), honey, wine, and Balsamic vinegar. Heat over medium flame until the mixture is reduced by half. Transfer to a serving bowl with a ladle. Place the bowl on table beside the carved Duck and everyone can spoon as much sauce as they like on their portion of duck. Many of the galantine recipes I’ve seen call for simmering the bird in broth, but I like the idea of roasing it in an oven better, since presumably you get nice crispy skin. The plum sauce sounds wonderful as well.